It's never good when NFL Hall of Famers are calling you out…particularly if you haven't even taken an NFL snap yet. But the hard-partying, hard-living lifestyle of Johnny Manziel are already getting him some sideways looks from guys who know a thing or two about how to survive and thrive in the National Football League. Manziel was expected to be a top pick in last month's NFL Draft, but saw his stock tumble all the way down to the Cleveland Browns and the number 22 pick. And according to former Dallas Cowboys great Emmitt Smith, the fastlane lifestyle favored by the young quarterback could put him on the fast-track right out of the league. 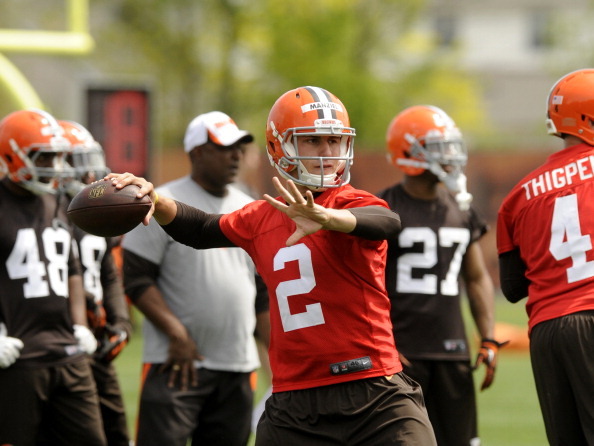 In fairness, Manziel's been a model rookie Browns mini-camps so far, so Smith's warnings are just that — warnings. But it's never good when a player reknowned for his heart and desire starts questioning yours. Good luck, Johnny Football.